The combination of declining interest rates and tightening credit spreads drove fixed-income markets higher across the board in the first quarter. 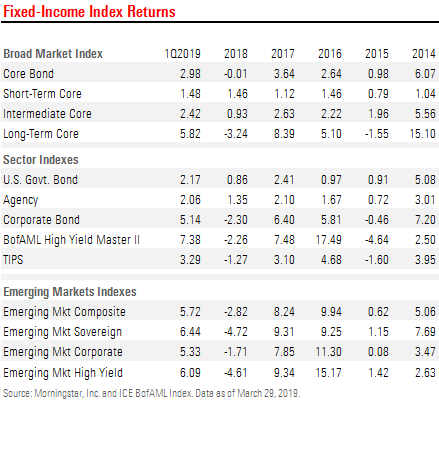 Morningstar's Core Bond Index, our broadest measure of the fixed-income universe, rose 2.98% in the first quarter. Underlying the Core Bond Index, Morningstar's Short-Term Core Bond Index increased 1.48%, the Intermediate Core Bond Index rose 2.42%, and the Long-Term Core Bond Index surged by 5.82% this past quarter. In the Treasury market, the Morningstar U.S. Government Bond Index increased 2.17% and in the agency market, the Morningstar Agency Bond Index rose 2.06%. Even though inflation expectations remained relatively unchanged over the past three months, the Morningstar TIPS Index gained 3.29%.